Occurs commonly throughout England, Wales and Scotland including all our islands; records appear to be less dense through the west country and the northern highlands and the highest density appears to occur from the north midlands to the Scottish borders (Luff). The species has been common and often abundant throughout out Watford area each year since 2005 and during our June 2009 field trip further south along the river Colne valley we recorded the species from Denham (Bucks), Uxbridge and Cowley (Middx). Usual habitat is open grassland and arable land including parks, gardens, weedy wasteland, heathland etc., adults spend the day among the base of tussocks or within cracks in the soil. In preparation for this write up we searched 100 metres of pathway along the river Colne margins at Radlett road at 10.45 pm on 20th July 2009 and recorded 11 specimens within five minutes, nine females and two males, in our experience searching nocturnally in any of the local parks will give similar results. Adults become active and start to turn up in pitfall traps (locally) during May and soon become common everywhere, they remain active through the summer and into the autumn, October or November depending on season; unlike some carabids which enter diapause in late summer and so become scarce, melanocephalus remains active (at least locally) through the summer; often the best times to see them are on hot and humid nights in August when, among hundreds of other insects eeg ants, aphids, earwigs and other small carabids they are abundant under the sodium lights along Radlett road and Oxhey park. The species is an autumn breeder (Luff, 1998) and at this time they be found, often in small groups, under accumulated fallen leaves along parkland or garden fences, under hedges or around the base of trees etc. A medium sized carabid, very distinctive due to the bicoloured body, the only confusion might be with Calathus cinctus Motschulsky. 6-8.5mm. Head shiny black, sometimes with a faint metallic lustre, produced forward in front on antennal insertions. Eyes weakly convex, frontal furrows weak or (often) not visible, two setiferous punctures beside each eye. Mandibles vary from black to rufous, antennae and palps entirely rufous. Pronotum red, generally a little darker than the legs, slightly transverse and finely bordered laterally, surface convex with weakly developed basal fovea. Broadest in front of middle then evenly curved to produced and rounded front angles, almost entirely straight and slightly contracted behind middle to almost perpendicular and finely rounded hind angles. Side margin broadened in basal third. Elytra elongate, broadest about middle and evenly curved laterally. Black with lateral edge and base behind basal stria red, this varies and we have specimens with entirely black elytra, very shiny in male, less so in female. Striae finely impressed to apex, interstices flat; third with up to five setiferous punctures (generally adjoining striae), the first of which is at the base of the scutellary stria, in our specimens these are variously missing. Eighth stria with large punctures throughout, epipleurs not crossed. Legs red. Claws serrate. Male with three basal protarsal segments dilated. Aedeagus varies a little in shape (Lindroth, 1974) but is distinctive owing to the strong apical tooth. 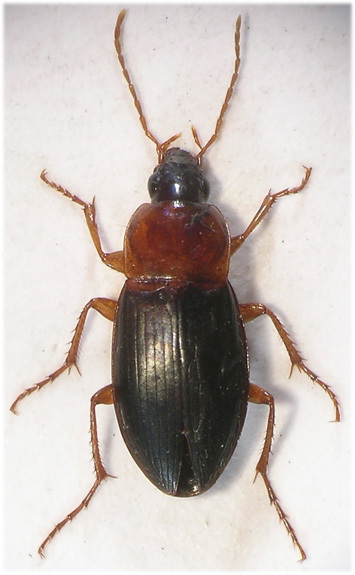 Calathus cinctus, only recently recognised as British by Anderson and Luff (1994), was formerly confused with C.melanocephalus, in this species the head and elytra are brown, the aedeagus is not constricted subapically and is not, or only very weakly, toothed at apex.